One of the coolest things about Bend is the constant, calming presence of the mighty Deschutes River as it meanders through town. You can stroll beside it, swim in it, paddle through it, float on it, and take pictures of it from dozens of spots around Bend. But what if you want to eat an amazing meal beside it? You can do that, too! 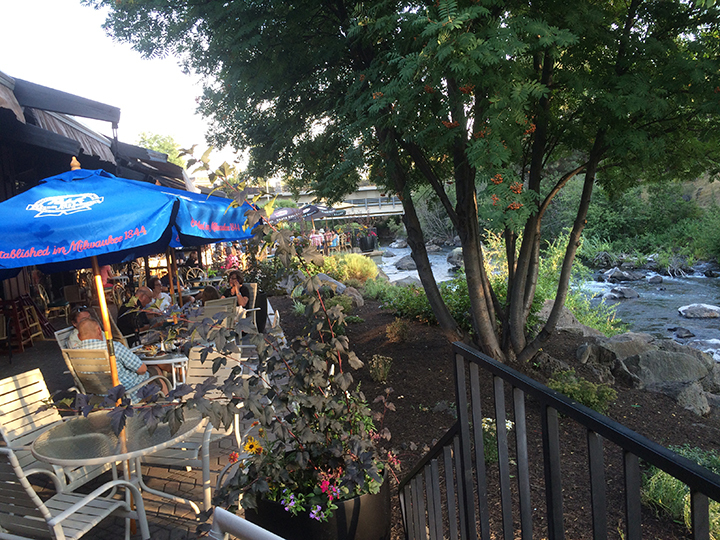 Here are 11 cafés and restaurants in Bend that boast views of the beautiful Deschutes River. To make it even easier, they’re listed in the order you’d encounter them if you hopped in your inner tube and floated from one stop to the next all the way through town. Um, I don’t advise that, by the way. Which little umbrella-covered table do you want at Red Robin? I know some folks turn up their noses at the idea of chain restaurants, but considering the views offered at Red Robin in Bend, you should make an exception for this one. If you have kids in tow, this is a sure-fire win with tasty burgers, freckled lemonade, and a kids’ menu that’s guaranteed to please everyone. In the warmer months, nab a table outside and watch the paddlers move past as you gobble your gourmet burger (I recommend the Bleu Ribbon Burger topped with tangy steak sauce, chipotle aioli, bleu cheese, tomatoes, lettuce, and crispy onion straws). Another bonus is the prevalence of bottomless everything. Er, I’m talking fries and drinks. Not the folks on the river. That would just be weird (not to mention uncomfortable to watch while you eat your burger). Cocktails and river views at Anthony’s Home Port! 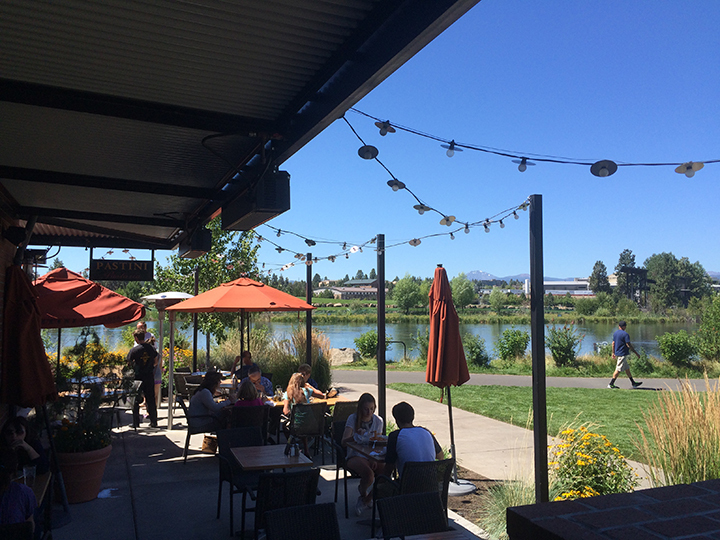 I’ve blogged countless times about how Anthony’s in the Old Mill District is one of my favorite summertime hangouts and one of the best happy hours in town, which would be true even if they didn’t have killer views of the Deschutes River. But the river views are the icing on the cake, or the ahi on the nachos, as the case may be. Seriously, their ahi nachos are THE BOMB, made with sashimi-grade ahi tuna, wasabi, and pineapple chutney served on taro chips. Wash them down with one of their seasonal cocktails, then stick around and order dinner. You can enjoy river views whether you sit inside or out, but I’m partial to the patio seating when the weather’s warm. While seafood is the specialty at Anthony’s, you’ll find a wide array of seafood and non-seafood dishes on the menu. The sunsets here are out-of-this-world, so make your reservations with that in mind. Gather ’round the fire pit, or claim a cozy table on the patio at Greg’s Grill. While Greg’s Grill is just a few hundred feet from Anthony’s and the two spots boast similar river views, the food in each spot is distinctly different. Come to Greg’s if you fancy contemporary Northwest cuisine like rotisserie prime rib, steaks, chicken, and more cooked to perfection over their Applewood and mesquite-fired grill. The architecture here is as fab as the food, with floor-to-ceiling windows, breathtaking woodwork, and a gorgeous fountain in the lobby. But the river views are a centerpiece for all of it, and you can catch those from the indoor dining area or the outdoor patio. Happy hour here is outstanding, and the bar menu is available all day as long as you’re seated in the lounge area (which also boasts a couple river-view tables). Order a steak and one of their divine Caesar salads, then pick something special from the wine list to accompany it. Now raise a toast to your spectacular meal and your river view. Cheers! As you might guess from the name, Pastini Pastaria serves Middle Eastern cuisine. Pasta, salads, and scrumptious river views at Pastini Pastaria in the Old Mill District. I kid. In reality Pastini Pastaria is known for flavorful pasta dishes made with fresh, local ingredients in the tradition of neighborhood bistros in Italy. Aside from offering more than 30 classic and contemporary pasta dishes, they also feature salads, antipasti, sandwiches, desserts, and most importantly, gorgeous river views. Their location in the Old Mill District just downstream from Greg’s Grill gives them primo views of a slightly different section of river, and the two fireplaces on their patio give you a great way stay toasty if the evening turns chilly. But even if you pick a seat indoors, there are several fab tables with river views. Kick things off with their Caprese salad, or opt for their three-salad sampler and try a variety of options like the kale salad, artichoke chicken salad, or a Caesar. Pair that with a nice glass of Chianti, then gobble up an order of their butternut squash and gorgonzola ravioli in sage brown butter sauce with toasted hazelnuts. Yum! 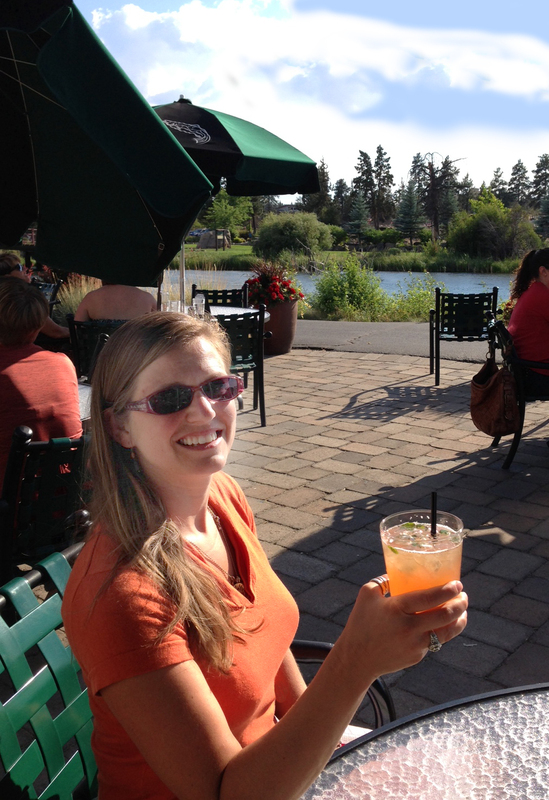 Craft Kitchen and Brewery is a fab spot to watch the sunset sparkling on the Deschutes River. UPDATED AUGUST 2018: Alas, Craft is no longer at their riverfront location, but their new digs on Bend’s NE side at Layton Avenue are pretty awesome, and the food is as fabulous as ever. Go visit them there! As the Deschutes River moves from the Old Mill District toward historic Downtown Bend, you’ll find Craft Kitchen and Brewery in that perfect little sweet spot between the two near the Colorado Avenue Bridge. A relative newcomer both to Bend and to the Bend Ale Trail, Craft Kitchen brews their own beer and also features suds from other craft breweries. The food here is quite tasty and served tapas style, which gives you the chance to try a variety of different items. The warm, roasted beet salad is citrusy and delicious and one of the best beet dishes I’ve ever tasted. Specialties like braised greens, shrimp and grits, and Johnny cake give you a chance to try southern-themed dishes you won’t find on every menu in town. But it’s the river views here that will truly knock your socks off. 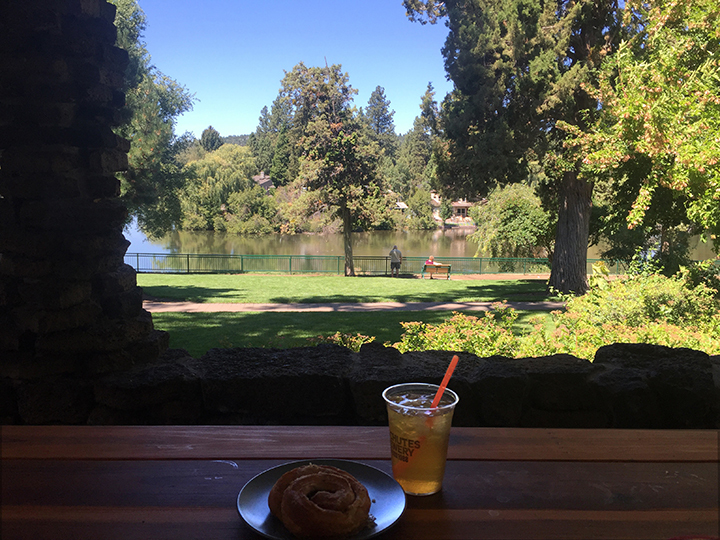 The restaurant sits high above the surrounding terrain, giving you stunning views back toward the Old Mill District and the Les Schwab Amphitheater. Get here early for a spot on the deck, or show up near sunset to watch the sky turn pink as colorful reflection shimmers on the water. The Ocean Roll and iced tea are nice, but the views are downright amazing at Crow’s Feet Commons. 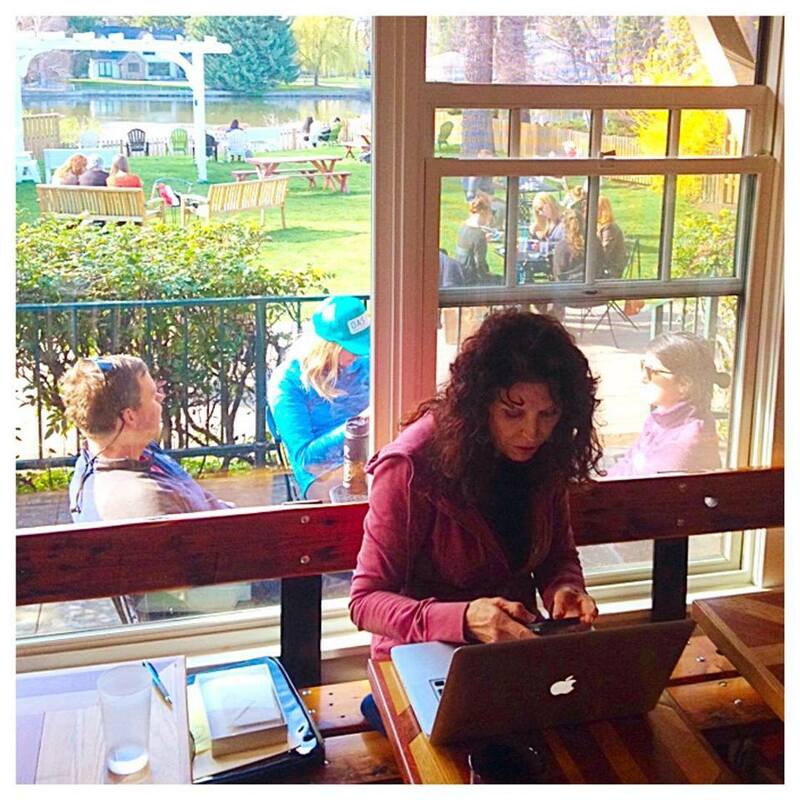 This cozy little café in Downtown Bend is one of the first river-view eateries you’ll come to after journeying from the Old Mill area to Downtown. Part bike shop, part café, part brew pub, Crow’s Feet Commons has a special vibe that’s uniquely Bend. The fare is limited to a few sandwiches, pastries, coffee, tea, and oodles of great beers and wines, so it’s ideal to come here for a simple breakfast or a post-hike brew. They often host live music in the evenings, so check the website for info. No matter when you show up or what you eat or drink, you’ll be treated to some of the best river views in town from their primo spot in Mirror Pond Plaza. Sit outside in the courtyard to feel the hustle and bustle of the Farmer’s Market on Wednesdays, or opt for a bit of privacy on their shaded back porch or inside the cozy little dining area. Get there early enough to nab an Ocean Roll from Sparrow bakery and a fresh-brewed chai tea, or choose from their selection of local craft beers to accompany a tasty sandwich. Bonus: They also rent bikes, host bike-centric events, and sell bikes and bike gear, so this is the perfect spot for cyclists to start the day. 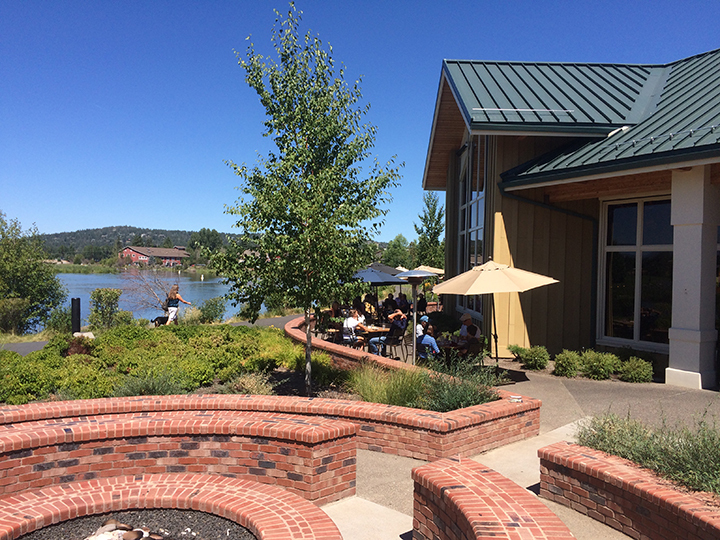 Soak up sunshine and river views whether you’re inside or outside at Looney Bean. Just a stone’s throw downriver from Crow’s Feet Commons, you’ll find The Looney Bean. It’s not a big, flashy restaurant with five-course dinners, but that’s kinda the point. This is the perfect, quaint little coffee shop for someone seeking fresh-roasted coffee, tasty tea, a real-fruit smoothie, or a breakfast sandwich. On busy summer days, you’ll likely encounter a long line out the door, with folks jonesing for their cuppa joe. Be patient and wait it out. The river views are worth a few minutes standing in line getting to know your fellow coffee connoisseurs. If you happen by on a quieter day, this makes a nice spot to set up your laptop and catch up on some busywork at a sunny table facing the river. You can also take your drink outside to enjoy on a bench facing the river with the breeze in your hair. Go ahead and kick off your shoes to feel the grass under your feet. This is what vacation feels like. 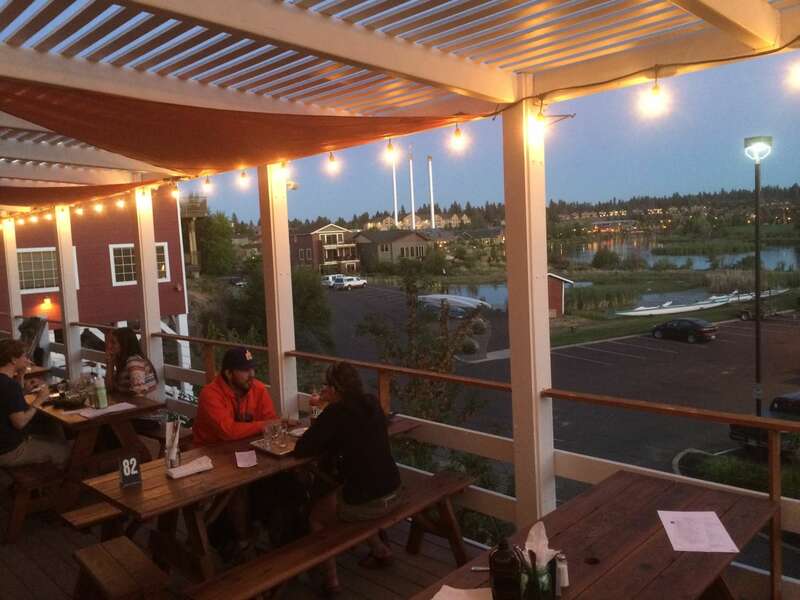 One of Bend’s oldest and best-known riverfront restaurants, The Pine Tavern. Probably one of the most iconic restaurants in Bend, Pine Tavern has been operating since 1936, and is best known for mouthwatering sourdough scones with honey butter, and for the two pine trees (one dead, one living) that emerge from the center of the restaurant through the roof of the building. While those things are admittedly pretty awesome, so are the river views from Pine Tavern. Reservations are a good idea, particularly if you want dibs on a river-view table or a spot on the patio. They’re open for lunch, happy hour, dinner, and another late-night happy hour. Come at dinnertime if you want to sample the aforementioned scones. I’m a big fan of their Chicken Marsala, though a friend claims they make the best prime rib he’s ever tasted. Regardless of what you choose for your entrée, save room for dessert, and don’t forget to click a few photos of the views so you can savor them long after your meal is digested. The river views might be a little obstructed at Bend Brewing Company, but the awesome beer totally makes up for it. 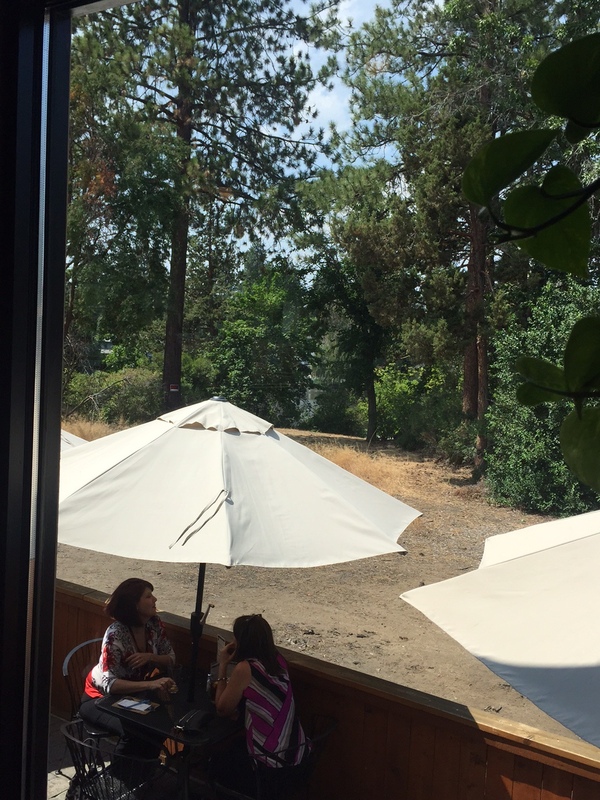 Full disclosure: The river views Bend Brewing Company should technically be classified as “peek-a-boo,” since they’re not the full-on flashy displays of Deschutes River glory you’ll get in the other dining hotspots along the river. But despite the slightly overgrown trees separating this cozy little brew pub from the mighty Deschutes, you can still catch glimpses of sparkling water from the elevated dining area or the sunny back deck. The fact that you can do that while also earning a passport stamp from one of the smallest stops on the Bend Ale Trail is a pretty nifty bonus. BBC is well-known as one of the locals’ favorite breweries, and their variety of experimental brews is one of the reasons. Ask your bartender for a taster of whatever’s seasonal and unique, then order a pint or perhaps a whole sample tray. The Elk Lake and the Ching Ching are my personal faves, but there’s plenty of good stuff to choose from. The fish and chips at BBC are extra special, or try one of their unique dinner salads. Then order another beer. Because really, you’re in Bend. And you’re on the Deschutes River. Enough said. Try Bend’s newest riverfront eatery (and some pretty incredible sushi) at Chi Chinese and Sushi Bar. This prime piece of river-front real estate has changed hands a lot in the 18 years I’ve lived in Bend, so I was thrilled last month to see it’s been beautifully renovated and transformed into a brand new restaurant. Chi Chinese and Sushi Bar boasts a fabulous array of unique cocktails, tasty sushi creations, and traditional Chinese dishes with a gourmet flair. They also offer views of a section of the Deschutes River most folks don’t spend time studying. It’s right on the edge of the Newport Avenue bridge, and while traffic noise and the presence of a spillway lend it a slightly more industrial feel, I quite like seeing a rougher, less-manicured, section of the river. As daytime fades, the back deck becomes a magical place illuminated by string lights and the glow of the setting sun. The expansive cocktail menu made it tough to choose just one thing, but The Emperor and the Mr. Chu were particularly outstanding. The Saigon Spring Roll is fresh and delicious, and there’s an awesome array of sushi to sample (try the Sweet Mama roll with tempura shrimp, snow crab, avocado, and cucumber inside, topped with seared salmon, mango, spicy tuna, scallions, and sesame seeds!) Be sure to request a patio seat or a river-view booth when you book your reservation. Fall in love with the food and the river views when you dine at Crossings at the Riverhouse. You don’t need to stay at The Riverhouse Hotel & Convention Center to dine at their spacious, river-front restaurant, Crossings. 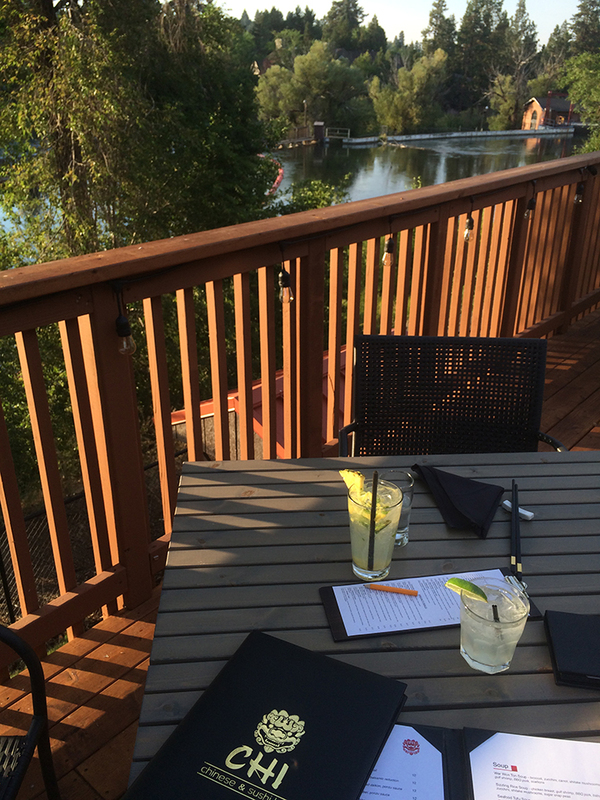 The fact that they serve breakfast, lunch, dinner, and happy hour makes them an excellent go-to spot almost any time of day, and the fact that their back deck offers killer river views makes it one of my favorite spots in Bend for river-view dining. The deck overlooks a rapid section of frothy whitewater, which is different from what you’ll see in the lazier sections of river through the Old Mill and Downtown Bend. There’s a fun energy to it, and the sound of crashing whitewater makes an exhilarating backdrop to outdoor meal. The menu here is constantly changing, but favorite dishes I’ve tried in recent months include the Island Breeze Salad (mixed greens, fresh papaya, mango, pineapple, avocado, candied walnuts, and mango citrus vinaigrette, though I love to add grilled shrimp for a couple extra bucks). I’d also go so far as to say their Pineapple Mango Fish Tacos are some of the best fish tacos I’ve ever tasted, and the mac and cheese (while small) is a divine blend of textures and flavors including pancetta bacon, parmesan bread gratin, and fontina and gruyere cheese with a hint of brandy. 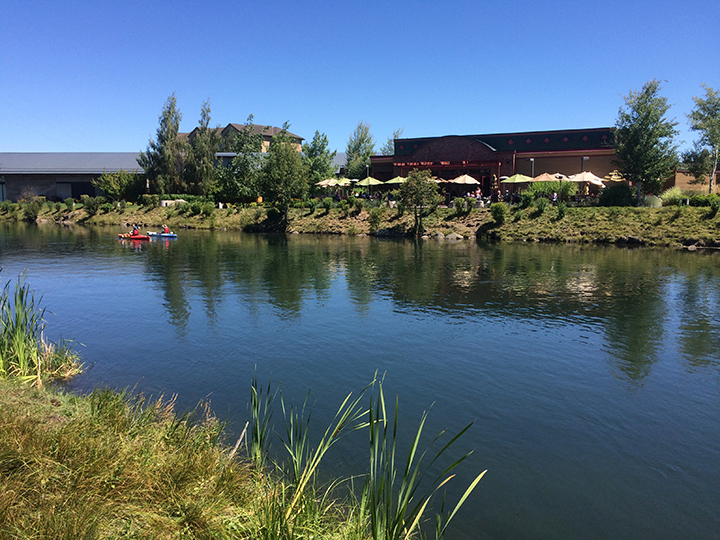 Pair your meal with a local craft brew from the bar or a crisp glass of white wine, then sit back and enjoy the sights and sounds of the Deschutes River. Previous article: Ready to rock? Add some rockhounding to your Bend vacation!